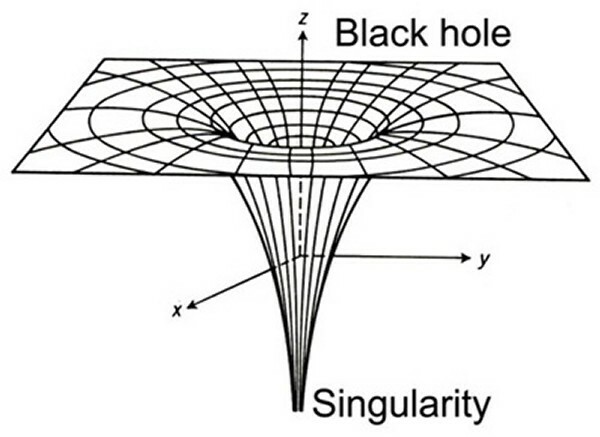 In the center of a black hole is a gravitational singularity, a one-dimensional point which contains a huge mass in an infinitely small space, where density and gravity become infinite and space-time curves infinitely, and where the laws of physics as we know them cease to operate. As the eminent American physicist Kip Thorne describes it, it is "the point where all laws of physics break down". Current theory suggests that, as an object falls into a black hole and approaches the singularity at the center, it will become stretched out or “spaghettified” due to the increasing differential in gravitational attraction on different parts of it, before presumably losing dimensionality completely and disappearing irrevocably into the singularity. An observer watching from a safe distance outside, though, would have a different view of the event. According to relativity theory, they would see the object moving slower and slower as it approaches the black hole until it comes to a complete halt at the event horizon, never actually falling into the black hole. The existence of a singularity is often taken as proof that the theory of general relativity has broken down, which is perhaps not unexpected as it occurs in conditions where quantum effects should become important. It is conceivable that some future combined theory of quantum gravity (such as current research into superstrings) may be able to describe black holes without the need for singularities, but such a theory is still many years away. According to the "cosmic censorship" hypothesis, a black hole's singularity remains hidden behind its event horizon, in that it is always surrounded by an area which does not allow light to escape, and therefore cannot be directly observed. The only exception the hypothesis allows (known as a “naked” singularity) is the initial Big Bang itself. It seems likely, then, that, by its very nature, we will never be able to fully describe or even understand the singularity at the center of a black hole. Although an observer can send signals into a black hole, nothing inside the black hole can ever communicate with anything outside it, so its secrets would seem to be safe forever.